Mild-to-wild haircolor: Katy Perry, Avril Lavigne, Lady Gaga & more! You’d have to be a Sister from Another Planet (or not care about hair) to be clueless about one of the hottest hairstyle trends for girls in their teens and 20s. It’s wild-n-crazy haircolor–from streaks to bangs to ends to all over! The younger generation has been flaunting these neons, pastels, prints or other unnatural hues for some time, and they show no sign of letting up! Guess we should have seen the growth of the crazy color trend coming because of its popularity with hot celebs like Katy Perry, Avril Lavigne, Kelly Osbourne and let’s not forget Lady Gaga. 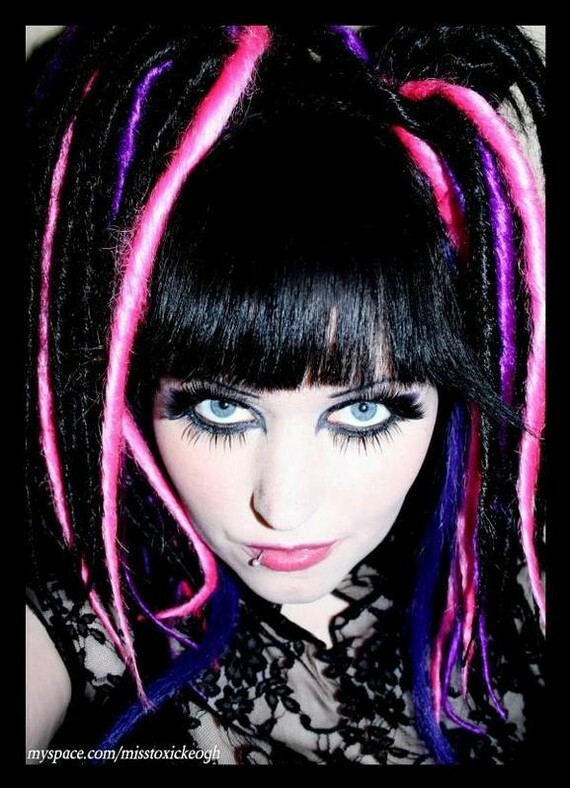 A couple of easy ways to wear the colored streaks temporarily are feather extensions and custom dreadlocks. It came as a shock to see custom-colored hair pieces available at etsy.com, THE SOURCE for handmade jewelry, fashions, art, home décor, etc., but not hair pieces! Feather extensions are the simple, subtle approach to color streaks. These from Wandering Eye Creations (via etsy) come in different lengths and widths in colors including purple to yellow and patterns such as grizzly to barred ginger. For more technicolor, consider dreadlocks. The dreads shown below are from Black Sunshine (again on etsy). Colors you can choose from are vast–reds yellows, even natural-looking browns and blondes. If Katy Perry-like streaks are too subdued for you, choose falls that cover more or all of the hair! Both kinds of fabulous fakes can be used a little or a lot… depending on your lifestyle, personality and love interests. Pin in a few around the face or place them randomly throughout. If you like how they work, recommend them to older women who wanna have fun or wanna show their true colors! This entry was posted in Celebs, Music, star hairstyles and tagged Avril Lavigne, Katy Perry, Kelly Osbourne, Lady Gaga, Teenage Dream. Bookmark the permalink. Thank you for the thank you and for letting me know about the url… what should it be?